Important note about sending mailings through Little Green Light: LGL Mailings are typically used for mail appeals and other similar types of mailings. 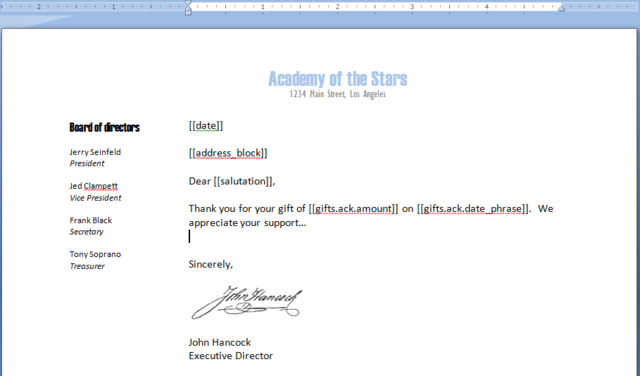 Sending gift acknowledgments requires a different and separate process, which you can read about here. Note: Word 2007 or later is required to use Microsoft Word letters in LGL. Attaching a Microsoft Word document to your Little Green Light mailing gives you much more control over the look and feel of your letters than using a simple LGL letter because it allows you to do things like add letterhead, embed photos, insert digital signatures, and use your preferred font and formatting. 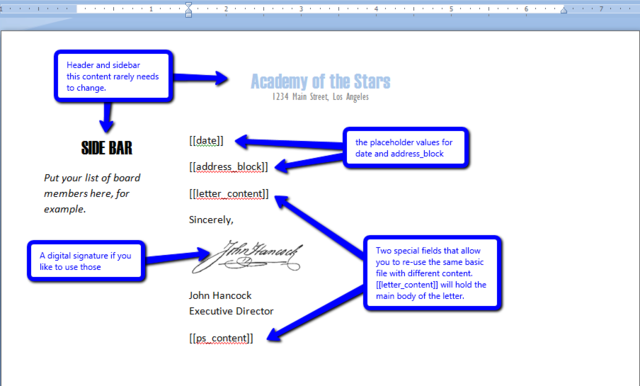 For this reason, we recommend using a Word document as your letter template. However, there are some caveats involved in using Microsoft Word that it is important to be aware of. Please review the dos and don'ts whenever you are create or use a Word document in your LGL mailing. Your file must be created using the Microsoft Word .docx format, which is available in Microsoft Word 2007 or later. LGL merge tags need to be used in order for the letters be merged properly with data in your LGL account. You can download a copy of the merge field reference from the Mailings page, or from your Help page. For general review, you can use this version. In your own LGL account, any custom fields that have been added will be included in the Merge Field Reference available from your Mailings page. LGL Mailings does not use MS Word's mail merge functionality. Instead, you will insert the LGL merge field (s) you want to use directly into the Word document positioned as you want the data to appear when pulled in. It is not possible to edit Word documents within LGL. Any editing of the files themselves requires downloading them onto your computer, editing them there, saving the changes to your computer, and re-uploading the updated file/s. In this case, we've defined the complete letter with merge tags in Word, which is an acceptable way to accomplish the goal. What's great about this approach is that you can use the exact same Microsoft Word file in many different letters and letter templates within LGL. This has the benefit of saving you time on file creation (you only have to create the one file) and also when it comes to making small updates to the content of your letters. 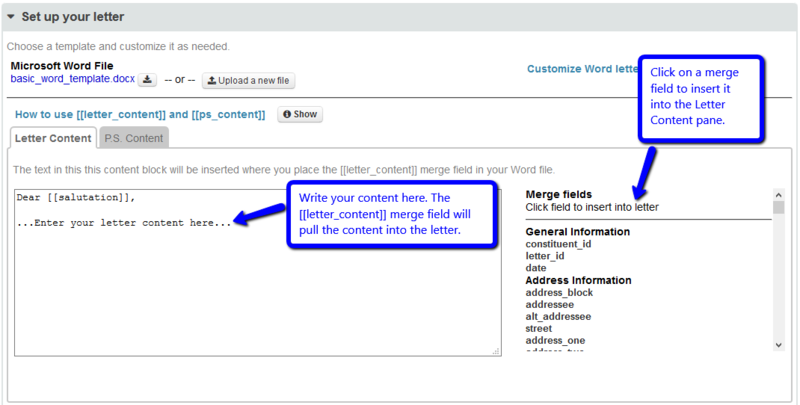 If you have a file set up to use [[letter_content]], you can make any changes that you need directly within LGL. You also have the option of using the "basic_word_template.docx" file, which can be downloaded to your computer, updated in whatever way you choose, and saved back in as your Word document template when you browse to it on your computer and select it. What is an LGL Merge Field and how it is used?